Banks County School System Superintendent Stan Davis announced Blair Loggins, special education teacher at Banks County Elementary School, as the Banks County School System Teacher of the Year on Monday night. Each of the four schools recognized an educator as Teacher of the Year. Chrystal Carlan, second grade teacher, BCPS; Lori Phillips, math teacher, BCMS; and Vicki Martin, media specialist, BCHS; completed the court of professionals. A committee of educators outside of the community interviewed the teachers and read their individual portfolios prior to making the selection of the system teacher of the year. Dr. Anna Sargent, an administrator in Hall County, served as an interviewer and commented, “These are all excellent teachers who are obviously committed to helping students and to their profession. Choosing a single winner was challenging, ” said Sargent. 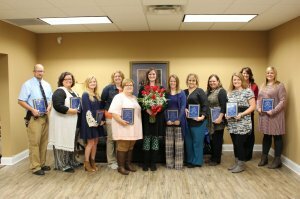 In addition to honoring the teachers, the system continued the tradition of recognizing Paraprofessionals of the Year and Classified Staff Members of the Year. Davis said of those being honored, “It is a privilege to recognize you and thank you for the job you do. We appreciate you and your service, ” he noted. Those honored as Paraprofessionals of the Year include Brooke Gee, BCPS; Jamie Armour, BCES; Shawn Bertrang, BCMS; and Teresa Royston, BCHS. Those named as Classified Staff Members of the Year include Michelle Brown, BCPS; Lynn Garrison, BCES; Kami Dalton, BCMS; and Carol Carter; BCHS. 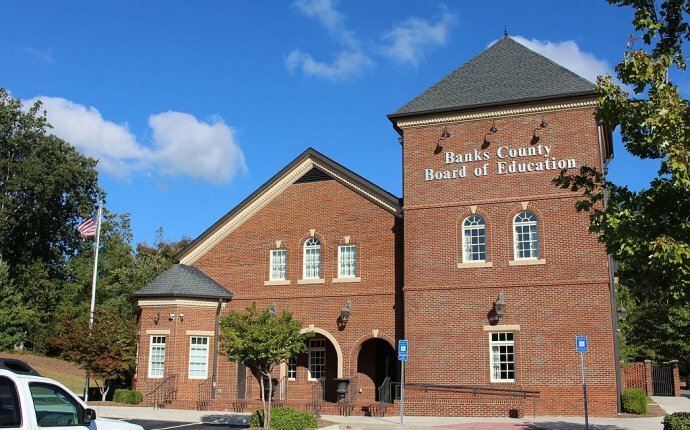 The Board of Education hosted a reception honoring all of the employees and their families on Monday, November 14th prior to the regularly scheduled meeting of the Banks County Board of Education. Pictured L to R: Shawn Bertrang, Carol Carter, Vickie Martin, Teresa Royston, Lynn Garrison, Blair Loggins, Jamie Armour, Chrystal Carlan, Michelle Brown, Brooke Gee, Lori Phillips, and Kami Dalton.